I strongly reccomend this book to any high school student looking at colleges. 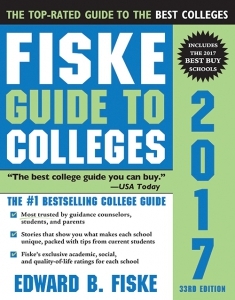 It’s the most comprehensive college guide I used during my college search, because it includes information other guides leave out. (some are in Canada too). The descriptions for each college are pretty long and in-depth, describing ALL aspects of the school, from the atmosphere and architecture, to academics, athletics, residence halls, and the most useful: what the students are like. At the time I wanted to go to a really liberal school, where most of the students are not only liberal but very outspoken. That’s not really a detail you find on a college website, but the Fiske guide says whether the students are mostly liberal or conservative, and whether activism and political action are prevalent activities. I even learned that one college provided vans to anti-war protests! In general I wanted to know if the students were like me, or the opposite. more socially diverse school. Still, I found the Fiske guide helpful. I was able to find out not only what kinds of programs were offered, but the strength of the programs I wanted to study. sources didn’t have, and it even included student points of view. Who better to ask about a school than the people who actually go there? True, it doesn’t have every school, so that’s a problem if you’re interested in a school it doesn’t include. And you do have to do a little reading, it’s so much more than just “at a glimpse” charts and quick facts, but it’s worth reading.